I grew up in Australia with a big lemon tree in my backyard, and I picked lemons whenever I wanted—which was often, since I added them to almost everything I cooked. Although I no longer have the lemon tree, lemons still play a starring role in my cooking. Nothing perks up my mood and my meals like a bowl of sunny yellow lemons, especially in late winter and early spring. The way I see it, a little lemon (or a lot) brings out the best in almost any dish. Perhaps you’ve noticed it, too. When you put lemons in the spotlight, your cooking has a little more edge, a little more interest. There’s nothing tricky about using lemons as a main ingredient. 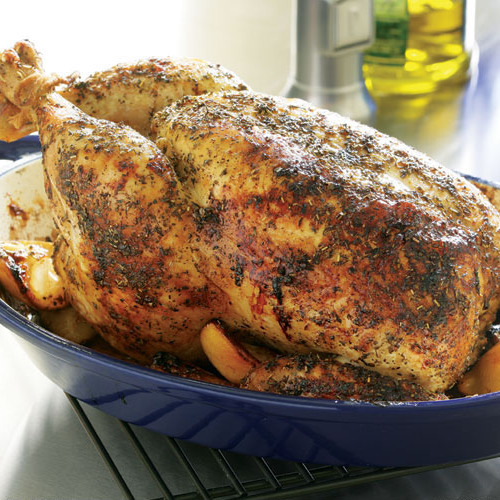 It can be a simple matter of using more lemon juice or zest or both in a recipe. Or of using the whole lemon—juice, pulp, peel and all—to flavor a dish. 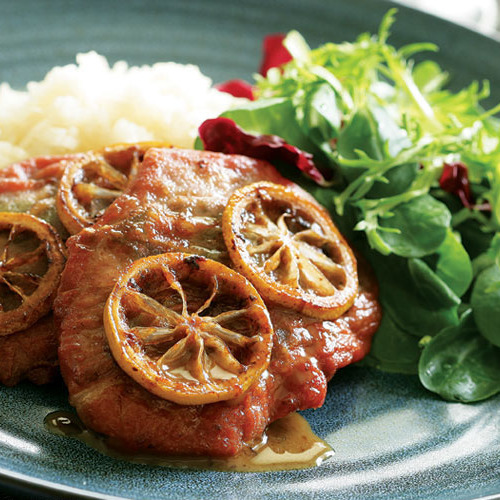 Or of using lemons in a different way: for example, caramelized lemon slices as a garnish for meat. Whichever approach you choose, you’ll highlight a different, delicious attribute of lemons: the bright, refreshing qualities of lemon juice, or the intensely citrusy flavor of the zest, or the combined appeal of a whole lemon. And in the recipes that follow, you’ll discover lots of ideas for putting lemons at center stage. Thick-skinned lemons, which tend to have pebbly-textured skin, are easiest to zest. Before zesting, scrub the lemon’s skin well to remove any residues (a soak in warm water can help remove any wax coating). Remove just the thin yellow layer of rind, not the white pith below. 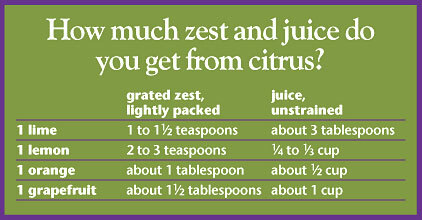 Zest a lemon before you juice it. I use a vegetable peeler when I want wide strips of zest for adding to slow-cooked dishes. 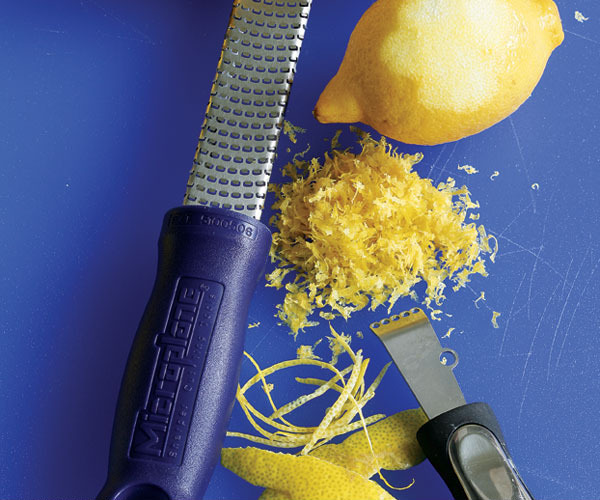 A channel zester gives you long, skinny strips of zest, but this tool doesn’t give you as much zest as a grater does. 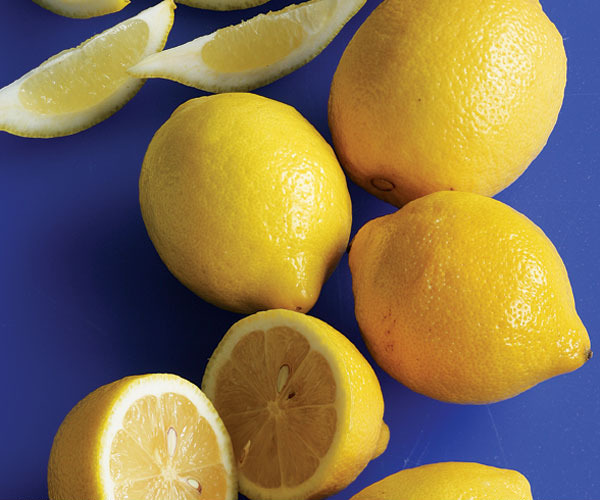 Save the flavor: You can freeze lemon zest in a sealed container for up to 3 months. • Add grated zest to breadcrumbs and use for coating cutlets and topping gratins. • Mix grated zest into ground meats when making meatballs and hamburgers. • Stir grated zest with chopped capers and parsley to top cooked meat and fish. 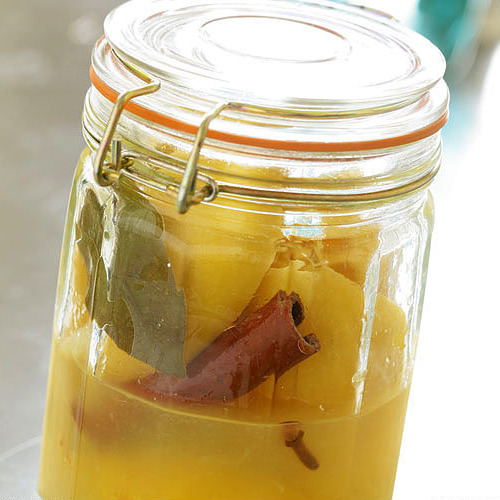 • Add a long, wide strip of zest when braising vegetables or meat or when making stock. • Make lemon sugar by putting strips of zest in granulated sugar. Use in cookies, cakes, or tea; sprinkle on French toast, or wherever. • Make lemon vodka by steeping strips of lemon zest in regular vodka. Taste the vodka regularly and remove the lemon strips when it suits your taste. 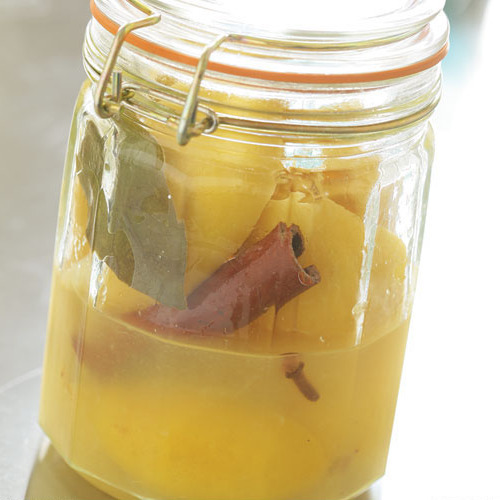 Or, infuse white wine with zest for aperitifs. • Add a strip of zest to your favorite cocktail. The juiciest lemons tend to be those with thin skins. If the lemon skin is smooth rather than textured, that’s a tip-off that the skin is thin. And small to medium-size lemons are generally thinner skinned than large ones. I find that juicers or reamers get the maximum juice from lemons. I especially like two-part juicers: The reamer and strainer are a single piece that sits on top of a container that catches the juice and has a lip for pouring. If you squeeze the fruit using only your hands, first roll the lemon on the counter and then microwave for 30 seconds. You’ll get more juice. 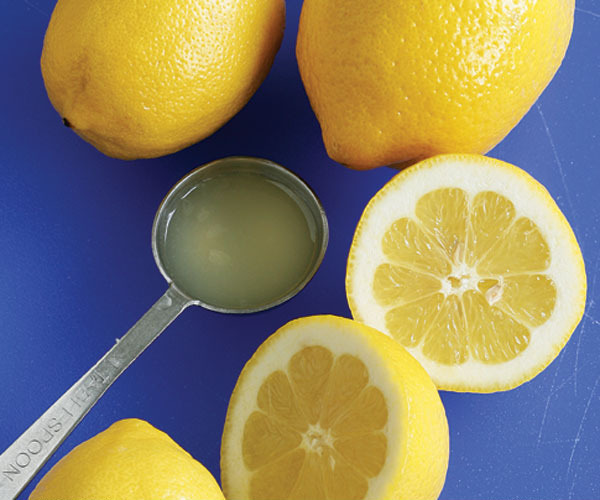 One lemon yields 3 to 4 tablespoons of juice. Don’t waste a drop: extra juice freezes well for up to 3 months. • Use lemon juice as you would a pinch of salt: It works wonders as a flavor enhancer. • Don’t be afraid to add a tablespoon or two of lemon juice to a stew or braise at the end of cooking to bring all the flavors together. • Drizzle juice over cooked vegetables just before serving to bring out their flavor. 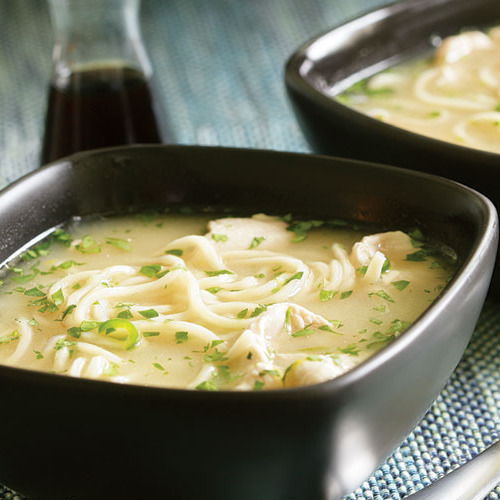 • Deglaze your pan with lemon juice and stock to make a tasty sauce or glaze for fish or vegetables. • Make lemon butter: Mix lemon juice, zest, and minced garlic into softened butter, chill, and cut into slices to top grilled meats, fish, and vegetables. 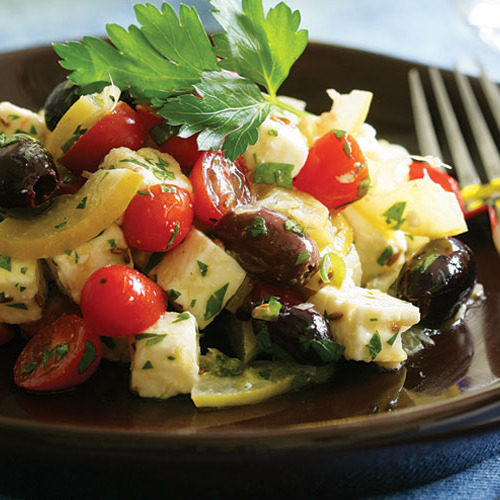 • Make a simple seafood marinade by mixing olive oil, lemon juice, and chopped dill or fennel. • Instead of reaching for the vinegar bottle, grab a lemon and replace the vinegar in salad dressing with lemon juice. How much zest and juice?